Hailing from The Windy City...Chicago, Illinois...the powerful and beautiful Melanie Cruise has been making her presence felt on the Midwest ladies wrestling scene. At six-feet tall, this athletic young woman has been catching the attention of all who see her in action...especially her opponents! Mixing an old-school style of brawling with her outright disregard for the rules, Melanie has been close to unstoppable as she cruises up the rankings of the women's wrestling division. Melanie Cruise: a future champion in the making! The tough, dangerous and beautiful Melanie Cruise! Cruise shows some disdain for the crowd as she heads to the ring. So much for the rules! Cruise seems to be having a great time choking the heck out of Daffney. At six feet tall, Melanie Cruise has no trouble holding her own in the ring against the men. Weight: Enough to kick your a$$. How It Started: I owe this one to my brother. He wrestled for a fed and I would always go watch him. I wanted to join, but I took a scholarship for track and I was too far away. But after I was done with that, I signed up for training...the day I got back! And it's history ever since. Gimmick: I do whatever I have to do to win. Simple as that. Biggest Win: All my wins are the biggest. Worst Loss: Whenever I lose it's always my worst loss. Favorite Type of Match: Wrestling is my passion, so of course I love every type of match. 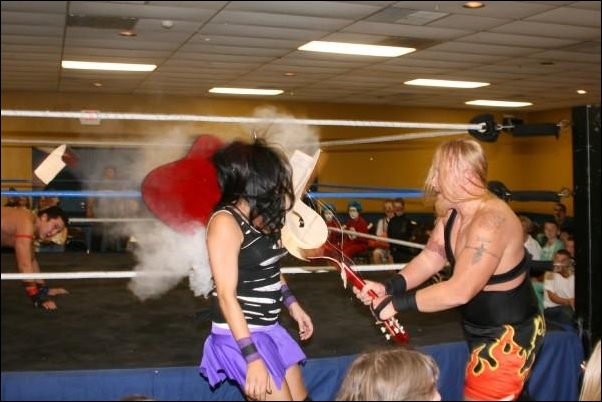 I've been in tags, intergender tags, best-of-three fall matches, street fights and even a dumpster match! Favorite Moves/Holds: Spinning sideslam; various suplexes; powerslams; pretty much anything that flattens my opponent down into the mat. Finisher: The Angle Slam and/or a version of the Farooq Slam. Biggest Allies: The only person I align myself with in the ring is my tag partner, Kanoa. Toughest Opponent(s): Every person I have wrestled has put up a great fight. It's all about who can outsmart the other person. Wrestling Ambition: Every wrestler's dream is to go all the way in wrestling. Some make it and some don't. As long as I'm wrestling for the rest of my life, I don't mind where it is. Athletics has always been in my blood. I played basketball and threw for track in high school and college. Those sports stopped when I started wrestling.....Wrestling has opened the doors for a lot of things: modeling, music and, mostly, a family.....I owe a lot to P.O.W.W. and huge thanks to everyone on the roster. They have gotten me to where I am now.....Wrestling has opened my eyes to what life really is. It's a dog eat dog world, but I wouldn't have it any other way.